The Wai Koa Plantation Trail is a beautiful way to engage with the scenery, history and community of Kauai Island. Strolling the trail provides sweeping views of Mt. Namahana, shady breaks in the largest mahogany tree farm in the United States and the opportunity to take a dip in a secluded 100 year old stone dam. Along the way, farms of all sizes and types decorate the landscape including local non-profit operations with gardens, animals and plenty of volunteer opportunities for the family. Be sure to sign in and complete a release form for trail passage at Kauai Mini Golf located just off Prince Kuhio Highway in Kilauea. The staff at Anaina Hou Community Park are very knowledgeable about the sites and stopping points available while you walk around the plantation. Take the time to talk with them will help you decide and plan your adventure. A busy community hub, Anaina Hou has free WIFI and delicious coffee as well tasty breakfast and lunch fare to keep you energized all day. Curious about the geologic formation, cultural history and jaw dropping plant life of the island? Go forth and play a round of mini-golf in the botanical garden that includes creative water features, informative signage and unique plantings of local fruit trees, colorful flowers and tropical delicacies. On Saturday mornings and Tuesday afternoons the south parking lot turns into a catch all local farmers market featuring fresh fruit, veggies, local crafts and unique grab and go foods. Don’t know what something is? The friendly farmers will always fill you in and often give out samples to win you over, just ask! Depending on where you park to begin the trail you can enter the calming and cool mahogany stands either at Anaina Hou or at the North Shore Dog Park located on Kahiliholo road in Kalihiwai Ridge just a few minutes north on Kuhio Highway. 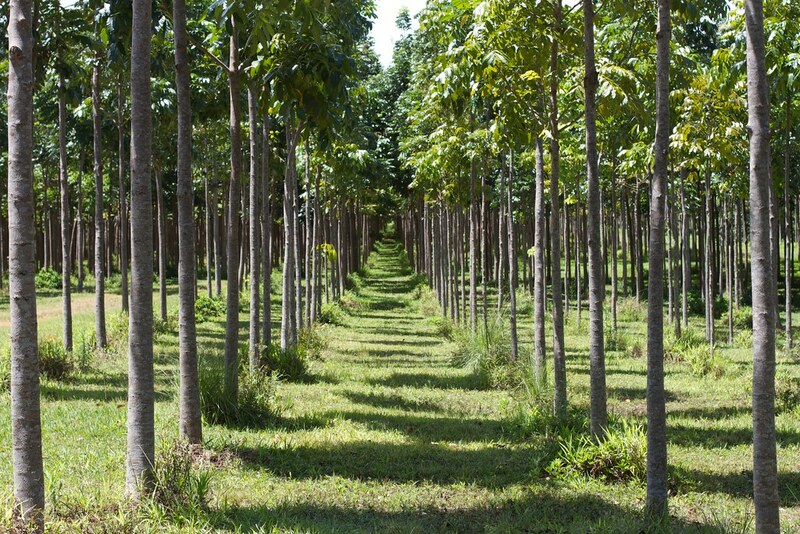 Home to over 86,000 individual Honduras Mahogany trees, this 200-acre section of the Wai Koa plantation is quiet and level and offers excellent coverage from the tropical sun or respective tropical rain. If you are looking to cool off and chill out, the tranquil and easily accessible stone dam offers swimming and lounging at the most perfect picnic spot on the island. Built over 100 years ago this dam provided water for the sugar cane farms that used to grow in Kilauea, and now it’s beauty and history can be admired while you take a quick dip! This meditative spot is the crown gem of the Wai Koa Loop trail. Located between Kauai Fresh Farms and The North Shore Dog Park on the Wai Koa Loop, the locally run not-for-profit Malama Kauai stewards a community garden, orchards of topical fruit and an educational Youth Garden that includes a pollinator forest project. Along this stretch of the trail, walkers will see horses and pigs, can wander through the Kauai Food Forest Project and enjoy awesome views of the mountains. Frequent workshops and educational volunteer opportunities are available for those with an interest in gardening, local food systems and Hawaiian agriculture. Fresh local fruits and veggies grown on the farm are offered for sale in the food safe at the front of the property along with a HI-5 recycling center where your recyclable donations are used to fund the organization’s farm to school programs! Whether you are looking to take a pleasant jog, walk and picnic with the family, to volunteer with a local non-profit or admire the natural surroundings of Kilauea Kauai, the Wai Koa Loop Trail offers you many unique and beautiful opportunities to enjoy the island. If you are interested in volunteering with Malama Kauai, The Kauai Food Forest or Anaina Hou links and contact information are listed below. Happy Strolling! Interested in volunteering on another part of the island? Check out our listing of volunteer opportunities by moku. Emma Cornish Jacobsen is an AmeriCorps VISTA Alumni of Malama Kauai, who served the North and East sides of Kauai Island developing local food and agriculture programs, and educating youth. Strong family ties to the island inspired her to move to Kauai to continue her grandparents legacy of giving back to the island community through sustainable service. Emma holds a degree in Environmental Studies from the University of Montana, where she focused on Environmental Writing and Literature. She hopes that her writing will encourage visitors to seek out community building experiences and local food while they explore Kauai.